The prairie vole was once a common species in the Great Plains, including the tall grass prairie in southern and western Minnesota. This species is now uncommon in Minnesota, limited to isolated or semi-isolated populations in 29 counties. The decrease in prairie voles in Minnesota is due almost exclusively to the destruction of its prairie habitat through plowing and over-grazing. This loss of habitat and the resulting population decline led to the listing of prairie voles as a special concern species in 1984. The prairie vole is a medium-sized vole with a stocky, compact body (Jones and Birney 1988). It weighs 16.8-49.1 g (0.6-1.7 oz.) and has a total body length of 119-166 mm (4.7-6.5 in.) (Hazard 1982). The pelage is generally grayish-brown with black and brownish-yellow tipped longer hairs, which gives them a grizzled appearance (Mumford and Whitaker 1982; Jones and Birney 1988; Stalling 1999), although several color variations have been found (Stalling 1990, 1999). The sides of the body are somewhat paler than the back, the tail is distinctly bicolored (Stalling 1990, 1999), and the belly fur usually has a yellow cast. The prairie vole greatly resembles the meadow vole (Microtus pennsylvanicus), but meadow voles lack a grizzled appearance, and rarely have a yellow cast to the belly. Identification by skull characteristics is preferred. Prairie voles, as the name implies, are a species which occur in grassy areas, particularly ones which have well-drained (dry) soil. In the Upper Midwest, prairie voles are mainly restricted to relatively undisturbed, dry grasslands (Hazard 1982), though they have been found in other habitats (Oehlenschlager 1994). Suitable ground litter for runways seems to be an important habitat feature (Stalling 1999), although it may not be required (Oehlenschlager 1994). Prairie voles are thought to be monogamous (summarized in Stalling 1990, 1999), with both parents caring for the young (Jones and Birney 1988). Males construct the nests and females line it with soft materials (Jones and Birney 1988). Reproduction in the northern part of the range occurs from late winter into autumn (Jones and Birney 1988), but occurs throughout the year in southern portions of the range, with activities being lowest in December and January, and highest in May through October (Stalling 1990, 1999). Gestation in prairie voles lasts approximately 21 days (Stalling 1999), and litters average 4 young (Stalling 1999). Young are full grown by 2 months of age (Stalling 1999). Relatively few litters are born during times of drought (Hazard 1982). Intervals between cyclic highs of populations seem to occur every 2 to 4 years (Stalling 1999), and seem to vary with the availability of succulent plant food, and thus rainfall (Hazard 1982). The lifespan of prairie voles is short, averaging 1 year in the field (Stalling 1990), and at least 16 months in captivity (Fisher 1945). Prairie voles have many predators including hawks, owls, common ravens (Corvus corax), shrikes (Lanius spp. ), snakes, coyotes (Canis latrans), foxes, weasels (Mustela spp. ), skunks, badgers (Taxidia taxus), bobcats (Lynx rufus), raccoons (Procyon lotor), opossums (Didelphis virginiana), short-tailed shrews (Blarina brevicauda) and northern grasshopper mice (Onychomys leucogaster) (Jones and Birney 1988; Oehlenschlager 1994). Prairie voles feed on green vegetation in the warmer months (Jones and Birney 1988) and seeds, tubers, roots, bark, and cached food items in the colder months (Jones and Birney 1988; Stalling 1999); insects are also eaten (Stalling 1999). Because they will eat bark, prairie voles can damage orchard trees (Jones and Birney 1988). The home range size of prairie voles varies from 0.11-0.22 ha (0.27-0.54 ac.) (summarized in Stalling 1990). It is assumed that prairie voles are territorial, as laboratory animals will not tolerate crowding (Gier and Cooksey 1967), and aggression in the form of biting has been demonstrated (summarized in Stalling 1990). 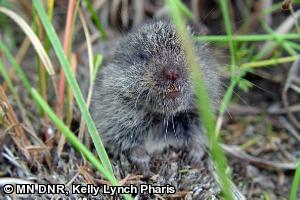 Prairie voles need regular censusing to monitor known populations and discover new ones. Large tracts (40-81 ha; 100-200 ac.) of suitable grassland habitat should be managed on a rotational scheme of grazing, burning, and complete protection of small areas to maintain portions of suitable habitat at all times. Conservation Reserve Program lands, especially those which have been out of agricultural production for several years, could be managed for prairie voles and other prairie species (Stockrahm 1991). Narrow dirt roads inhibit movements and act as dispersal barriers for prairie voles (Swihart and Slade 1984). Consequently, construction of roads in areas of known prairie vole populations should be avoided. The Minnesota DNR funded several surveys of this species, including work by the Minnesota Biological Survey (MBS), Moorhead State University, and others. MBS has completed surveys for this species in several regions of the state, including the southwest in 2006-2008. Fisher, H. J. 1945. Notes on voles in central Missouri. Journal of Mammalogy 26:435-437. Gier, H. T., and B. F. Cooksey, Jr. 1967. Microtus ochrogaster in the laboratory. Transactions of the Kansas Academy of Science 70:256-265. Hazard, E. B. 1982. The mammals of Minnesota. University of Minnesota Press, Minneapolis, Minnesota. 280 pp. Jones, J. K., Jr., and E. C. Birney. 1988. Handbook of mammals of the north-central states. University of Minnesota Press, Minneapolis, Minnesota. 346 pp. Mumford, R. E., and J. O. Whittaker, Jr. 1982. Mammals of Indiana. Indiana University Press, Bloomington, Indiana. 537 pp. Oehlenschlager, R. J. 1994. Notes on the Prairie Vole Microtus ochrogaster in Wadena County, Minnesota. Scientific Publications of the Science Museum of Minnesota 7(4):1-24. Stalling, D. T. 1990. Microtus ochrogaster. Mammalian Species 355:1-9. Stalling, D. T. 1999. Prairie Vole (Microtus ochrogaster). Pages 637-638 in D. E. Wilson and S. Ruff, editors. The Smithsonian book of North American mammals, Smithsonian Institution Press in association with the American Society of Mammalogists, Washington. Stockrahm, D. M. B. 1991. Distribution of small mammals in grasslands of western Minnesota with special emphasis on the Prairie Vole (Microtus ochrogaster), the Northern Grasshopper Mouse (Onychomys leucogaster), the Plains Pocket Mouse (Perognathus flavescens), and the Western Harvest Mouse (Reithrodontomys megalotis). Final report submitted to the Minnesota Department of Natural Resources. 53 pp. Stockrahm, D. M. B. 1995. Ecology of the Northern Grasshopper Mouse (Onychomys leucogaster) and Prairie Vole (Microtus ochrogaster) in Clay County, Minnesota. Final report submitted to the Minnesota Department of Natural Resources. 98 pp. Stockrahm, D. M. B., L. E. Schmitz, J. R. Gerads, E. K. Harper, D. E. W. Canfield, C. D. Cameron, M. D. Goertel, and K. L. Andrew. 1995. Small mammal ecology in western Minnesota grasslands. Poster presented at the Minnesota Department of Natural Resources Prairie Management Workshop, Moorhead State University Regional Science Center, Glyndon, Minnesota. Swihart, R. K., and N. A. Slade. 1984. Road crossing in Sigmodon hispidus and Microtus ochrogaster. Journal of Mammalogy 65:357-360. Wolfe, K. 1989. Prairie voles on wildlife management areas in Polk County, Minnesota. Final report submitted to the Minnesota Department of Natural Resources. 17 pp. Wolfe, T. J., R. H. Hier, and K. S. Wolfe. 1992. Habitat preference of Prairie Voles on Tympanuchus Wildlife Management Area, Polk County. Unpublished Report. 8 pp.